Find this book at Amazon.com | buch7.de | eurobuch.com | buchhandel.de | books.google.com ASIN=0913966622, Category: Economy, Language: E, cover: HC, pages: 572, year: 1981(1922). "Lenin's aggressiveness was an outgrowth of his conviction that he was the leader of the final world revolution. He considered himself as the legitimate successor of the First International, destined to accomplish the task in which Marx and Engels had failed. The knell of capitalism had sounded, and no capitalist machinations could delay the expropriation of the expropriators any longer. What was needed was only the dictator of the new social order. Lenin was ready to take the burden upon his shoulders." 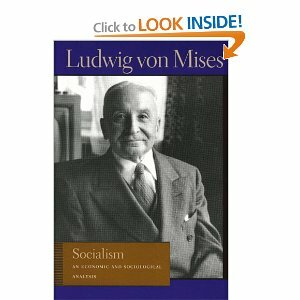 -- quote p E103 from Epilog (1947) of "SOCIALISM: An Economic and Sociological Analysis" by Ludwig von Mises, 1922.